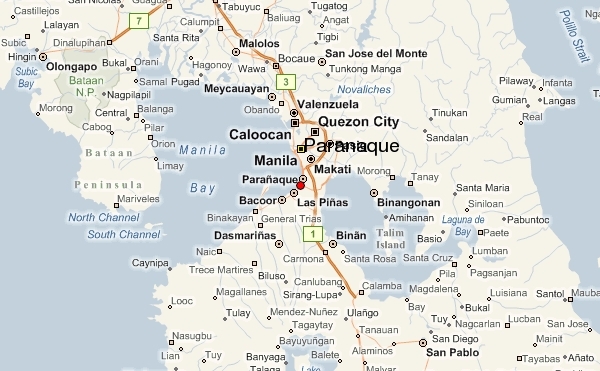 Last February 2010, my friend Benjie Velasco invited me to visit the other side of Paranaque, Metro Manila. We visited a squatter area, Tucuma that sits right in the middle of a leafy, middle class suburb. 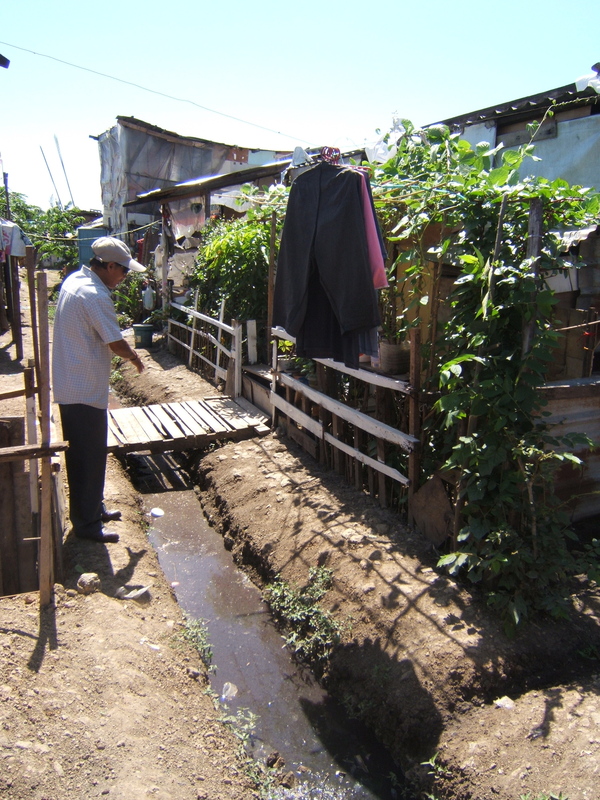 It was one of the emotional highlights of my trip as I learned about the struggles of the residents of Tucuma to live with dignity and hope as they try to rebuild their lives, one ditch at a time. I was staying with my aunt Mely who lives in Paranaque City during my visit to Manila. Her comfortable home is surrounded by other comfortable, middle class homes with their cars and minivans parked in front. 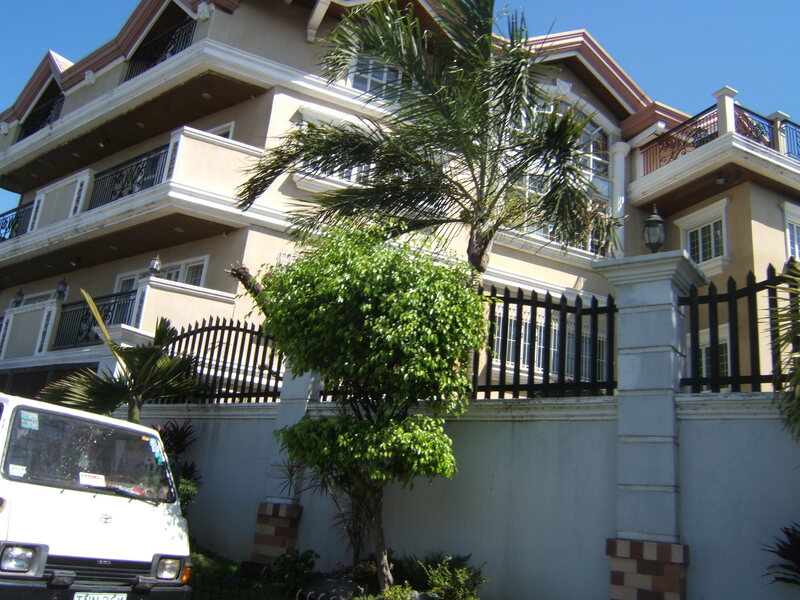 The mall is not too far away and a nice, leafy park with a jogging path is conveniently located just around the corner. Who would have thought that behind the facade of middle class comfort lies a ghetto of squalid poverty? Benjie and I took two tricycle rides to get around to the entrance of Tucuma even though it was no more than a mile from my aunt’s home. A ritzy, three story mansion was towering right next to the entrance of Tucuma (see photo above). Other similar wealthy homes lined up the area. I started getting suspicious that we were in the wrong neighborhood looking for a squatter area. Don’t be fooled. Behind the curtain of ritzy homes and fancy cars of Paranaque, lies the Tucuma squatter area with their clapboard homes and the open sewers and ditches. Despite the squalid conditions, Benjie and I were received with a hero’s welcome. The residents hanged welcome banners lining up the dirt path toward their homes. The children even prepared a musical number and serenaded us. However, the cheerful voices of the children did not hide that they live in poverty. They have no running water, electricity nor basic sanitary conditions. Open sewers and ditches lined up their clapboard houses. The residents there live with dignity and hope as they try to improve their situation and get out of poverty. Partido ng Manggagawa, a political party is helping them in an uphill, legal battle to stay in the area. The community leaders of Tucuma are planning a community fundraiser to build a drainage ditch to divert the open sewage and to build more concrete pathways before the rainy season arrives in a few months. I’m hopeful that the residents of Tucuma will be able to raise enough funds, about $500 US dollars, to build the drainage ditch and avoid the overflow of raw sewage and eventually prevent the spread of communicable diseases to the children and families that live in the area. Who knows a Filipino online community based in CA might be able to match the grassroots funds that the Tucuma residents will raise. Indeed, there is hope – one ditch at a time. This entry was posted in Diaspora Donors, Health, philanthropy, Philippine poverty, Philippines and tagged Diaspora Donors, Health, philanthropy, Philippine poverty. Bookmark the permalink.